START Treaty: When Will We Ever Get a STOP Treaty? The New START Treaty: When Will We Ever Get a STOP Treaty? A Guest Post by Dr. John Bogen, M.D. Rich Lowry, Editor of the National Review wrote an op-ed column titled  A Poor START for the online political website, RealClearPolitics on November 22, 2010. Lowry questions why the New START Treaty (Strategic Arms Reduction Treaty), signed earlier this year by U.S. President Barack Obama and Russian Federation President Dmitri Medvedev, is being promoted as such a crucial issue by the Obama Administration that requires immediate ratification by the U.S. Senate before the end of the lame-duck session in December. 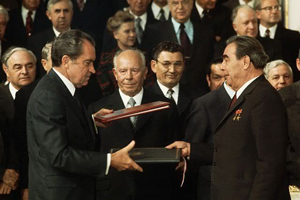 The history of the START goes back over forty years to 1969, when negotiations began for the original SALT I (Strategic Arms Limitation Talks) Treaty between the United States and the Union of Soviet Socialist Republics (USSR). This ultimately culminated in the signing of the Anti-Ballistic Missile (ABM) Treaty in 1972. U.S. President Ronald Reagan and Soviet leader Mikhail Gorbachev in 1987 signed the Intermediate-Range Nuclear Forces (INF) Treaty, which eliminated certain intermediate-range missiles for the primary purpose of enhancing the security of Western Europe. Russian Pres. Putin and U.S. Pres. 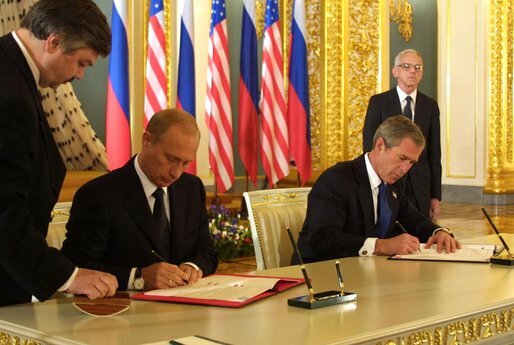 Bush signing the Strategic Offensive Reductions Treaty (SORT), better known as the "Moscow Treaty," 2002. Photo: The White House Archives. The Strategic Offensive Reductions Treaty (SORT), better known as the Moscow Treaty, was signed in 2002 by U.S. President George W. Bush and Russian Federation President Vladimir Putin, further limiting the numbers of nuclear warheads, yet failing to contain verification provisions. SORT expires in December 2012. President Obama, who ran on a platform of a nuke-free world, took office in January 2009, and had his administration negotiate with the Russians a New START treaty as a follow-on to START I and SORT. This was signed in April 2010. Lowry asks a legitimate question in his op-ed piece, why the sudden rush for ratification of New START? As noted above, past treaties have been adhered to without formal ratification. The Senate and in fact the entire Congress faces more pressing issues, such as deciding on an extension of the Bush (43) tax cuts and dealing with the economy, not to mention immigration reform and energy policy. Isn’t the New START a relic of a Cold War that came to an end almost twenty years ago with the dissolution of the old Soviet Union in 1991? And in light of the growing nuclear threats from Iran and particularly North Korea dominating the news on November 23, 2010, why is the president pushing so hard for ratification of an obsolete treaty that does little to make the world safer from nuclear conflict? Personally, I think any treaty between the U.S. and Russia that falls short of completely eliminating nukes is meaningless. Both countries have no desire for war let alone nuclear war. There exists a new global war, to be politically incorrect, between a growing list of nations and Muslim extremists. Nuclear powers including the U.S., Russia, China, India, Britain, France, Israel, and Pakistan all face conflicts with radical Muslims. These jihadists have also murdered hundreds in Spain, Turkey, Indonesia, the Philippines, and several African nations. And that doesn’t even count Iraq or Afghanistan. Regional hotspots also exist with rogue nations such as North Korea having recently acquired nukes and Iran widely believed to be endeavoring to do so. U.S. Pres. Obama and Russian Pres. Medevev signing the "New START" treaty, April 8, 2010, in Prague, Czech Republic. Photo: Courtesy AP. So, I believe New START is irrelevant in today’s world. The U.S. and Russia are moving towards smaller arsenals through attrition and both countries do not have the money to keep the numbers up. Regardless of the treaty, both countries still have enough nukes to destroy the world many times over. Does it really matter if you have 2,200 or 1,550 or 500 or 100 nukes? This treaty is obsolete even before it has been ratified. Inspections could be extended without even mentioning numbers, and the numbers would come down on their own through obsolescence. 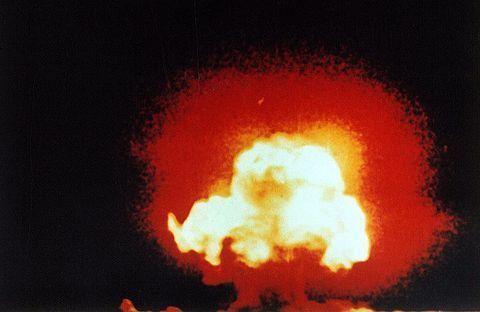 Completely eliminating nukes from the arsenals (except for maybe a token number just in case they are needed for example, for asteroid mitigation–not unlike the stocks of smallpox kept secure in the U.S. and Russia, needed for the manufacture of vaccines should the disease reappear somewhere in the world) would be a bold step the U.S. and Russia could take. This might reduce the desire for nuclear proliferation throughout the world, or at least embarrass rogue nations by making them appear less civilized (e.g. “We are civilized. Nukes are so ‘yesterday.'”). 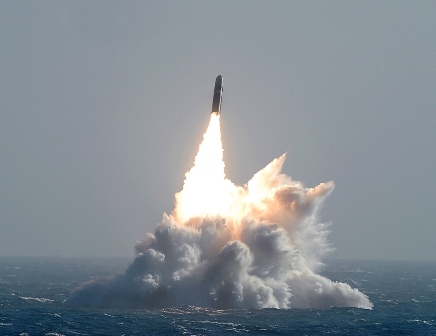 Even if the U.S. gets nuked someday by a terrorist bomb via a shipping container smuggled into a port city, or by an ICBM from a rogue nation, the U.S. won’t respond indiscriminately with a nuke. And that is the biggest reason to abandon New START – a treaty designed to reduce yet continue the obsolete military doctrine of Mutual Assured Destruction (MAD). The current conflict over New START ratification between Democrats and Republicans is purely political posturing and is meaningless from the national security standpoint. I disagree with Senator John Kyl (R-AZ) trying to get more money (which we don’t have) appropriated for modernization of our nuclear arsenal. However, he does have a valid concern that Russia wants to limit the U.S.’s ability to field an anti-ballistic missile system, which most certainly would be for protection against limited missile strikes from rogue nations, rather than to defend against Russian attack. I also disagree with the Democrats for making this treaty out to be more important than it really is, and who just wish to deliver a foreign policy victory to President Obama, following his recent lackluster Asian and European trips. The political void of the November-December lame duck period is about as empty as Washington D.C. is every August – much ado is made about nothing. Ratification of New START should hardly be the highest priority for the Senate when the economy, unemployment, tax rates, and the deficit / debt are far more pressing issues. The Congress and President Obama should get their priorities straight. And so that the Russians do not feel ignored, I would begin negotiations on START IV, a.k.a. STOP (as in STOP ALL NUKES), a much bolder push to lead the entire world away from dangerous and destabilizing nuclear weapons. This entry was posted in Extreme Thinkover, Middle East Conflict, Nuclear Proliferation, Political Commentary, START Treaty and tagged Extreme Thinkover, John Bogen MD, National Review, Nuclear proliferation, Political Commentary, RealClearPolitics, Rich Lowry, START II, war by Dr. David Waggoner, PhD. Bookmark the permalink. Thanks a million! It is one small step in a mighty battle to get proper recognition for my father, a civilian on the project ~ the only one with the foresight to think this “Gadget” might do something in color worthy of capture. The ONLY color photo of Trinity was taken by JACK W. AEBY. Please correct the spelling. Thanks! Your caption: “The First Atomic Blast “Trinity” Taken by Jack Abey. July 16, 1945. Only known surviving color photo of the blast. Photo: PD” needs to be corrected. JACK W. AEBY took the only color photo of Trinity. Please make this change. Nicely reasoned piece. It changed my perspective on the current bloviating emanating from the Beltway. The Deficit Reduction Report and potential resulting legislation seems much more critical and ripe for producing marvelously ignorant hyperbole.